CQWW SSB in England seemed to be automatically dogged with terrible weather forecast for hurricane force winds and as you can appreciate this made everyone twitchy however at Birdlip we didn’t get affected too much apart from some strong gusts on Sunday which made us double check all the guys. TB-3 and the 4el for 10m. Neverless we dropped the antennas soon as the contest finished before getting some shut eye about 1am, packing resumed about 9am then retreated to the pub for a few beverages and a late lunch. Conditions seemed excellent, although soon into Saturday we noticed that the triband tb-3 yagi we normally use has decided to go faulty and not tune on 10m and although it tuned on 20-15 ok it didn’t seem to radiate so we’re about 2000 QSOs down on what we would have been expecting in this contest. Sunday redeemed itself when we put up a 10m monoband yagi (4el) which is actually a converted CB antenna however this paid off as you’ll see in the results below. Low bands proved fantastic (not 160m) we had some fantastic runs during the night to NA and at times SA when propagation allowed and we wasn’t being killed by splatter from ultra wide signals coming out of eastern Europe. 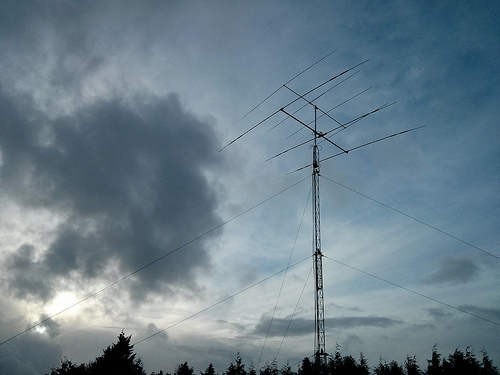 Equipment: K3, P3, KPA-500, TB-3, 4el mono for 10m, verticals for 40/80m and a dipole for 160m. Logging was provided by Win-Test. What did we learn from the contest? Never trust trapped antennas (we’ve a new antenna in the pipeline for our next effort! ), we all figured out we know little about 160m and we suffered. We need to sort out a mult station this would allow us to improve the score a lot.